Be a part of TEAM Commerce. What if you could help shape the future of Maryland? That’s what we do at Commerce. Our goal is to make Maryland the best place to live, work and raise a family. Every day we strive to provide exemplary customer service. From helping a small business person with a big idea kick start a dream to assisting companies with expanding to new markets across the globe, our mission is to create more opportunities for everyone in Maryland. We love this state, and we’re looking for people who want to be a part of this mission. What’s it like to work at Commerce? Maryland’s Department of Commerce is out to change the way business is done. Our corporate culture is award-winning. We are customer oriented. We are results-driven. We are Commerce. Use your sales skills to attract new companies to Maryland. Keep the ones we have here happy and growing. Team members foster strong relationships with the state’s federal facilities, universities and military installations. Regional field staff, small business, biohealth technology, military and federal affairs, strategic and finance teams work collaboratively with partners at all levels to provide financial, counseling and technical assistance to businesses. Be creative. Share Maryland success stories through our many channels, using digital marketing, media relations, publications, advertising and research to market Maryland’s business community. Plan events and trade shows and work closely with our business development team to promote Maryland’s key strengths. Promote Maryland’s quality of life and all the fun stuff that Maryland offers in order to attract, create and retain jobs in the tourism and creative industries. Showcase Maryland and assist tourists at our welcome centers. Keep the Agency running smoothly. Commerce support teams include Information and Technology Management, Budget and Finance, Human Resources, General Services and Contracts and Procurement. Provide support to Maryland companies planning to enter new foreign markets or advance export sales. Assist foreign companies seeking to establish a U.S. or North American presence in Maryland. Develop business relationships between U.S. military bases, federal laboratories, and private companies in Maryland to help create and retain jobs. Help businesses diversify to reduce their dependence on the federal government. Our main offices are located in the World Trade Center Baltimore and feature breath-taking waterfront views – right in the heart of Baltimore’s historic inner harbor. Live in one of Baltimore’s many cool surrounding neighborhoods and take a water taxi or bike ride to work. Enjoy shopping or a walk through Downtown’s historic districts during lunch. Downtown Baltimore has scenic sights, green parks and plazas, historic buildings, afternoon Orioles games, and some of the best restaurants to grab a bite in the region. Subsidized parking, free transit, and walkability round out the reasons why Commerce is one of the best agencies to work for in Maryland. 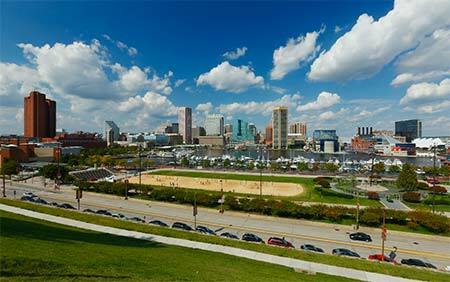 Learn more about Downtown Baltimore. Here are the current Commerce opening(s) we have. Want to check out other state opportunities? View all state job listings. Don’t see a job opening that fits? We are always seeking the best and brightest for future positions. Please email your resume here for consideration. We understand the importance of family and children. Our family-friendly benefit practices and policies offer the support and flexibility you need at work and at home. Visit Maryland’s Department of Budget and Management for more information. ​The state’s generous leave package includes from 10 to 25 days of annual (vacation) leave per year, depending on seniority, as well as six personal days each calendar year. In addition, Commerce offers 11 paid holidays and 15 days of sick leave per year. ​You and your family may benefit from our medical, prescription, dental, vision and behavioral health coverage and also be eligible for life, accidental death and dismemberment and long term care insurance plans at low group rates. We offer Health Care and Day Care Flexible Spending Accounts that allow you to save, on a pretax basis, for health care and day care costs incurred during the plan year. ​Commerce team members typically work a forty-hour work week and flexible work schedules. The Teleworking Program enables eligible state employees to work at home, at a satellite office, or at a Telework Center. ​Commerce team members are eligible for participation in a contributory defined benefit pension plan in which they are vested after ten years. State employees are also eligible to participate in two supplemental retirement plans: the 457 Deferred Compensation Plan and the 401(k) Savings and Investment Plan. ​Permanent state employees are entitled to use the Light Rail, the Baltimore Metro Subway and bus service in the Baltimore metro area at no charge with a valid State ID card. Parking near the World Trade Center is also offered at a subsidized rate for most Commerce team members.